We take coffee seriously at The Roasted Bean, so much so that we roast our own on the premises from the finest global varieties. Sneak a peek at the process through the big window as you walk in the café. Inside, you’ll find a comfortably intimate and friendly ambience that is delightfully unique. Here, you can still say “small” or “large”… you can even order one of our adults-only coffees, prepared with the finest liqueurs. Taking a cue from European sidewalk cafes, The Roasted Bean’s tables are prime people-watching real estate. Linger over your morning paper with a warm breakfast sandwich. Enjoy a light lunch. Take a mid-afternoon shopping break with freshly baked pastries. Refresh and relax with an herbal tea. Or just drop by for your favorite coffee fixation – straight up, blended, frozen – you name it. 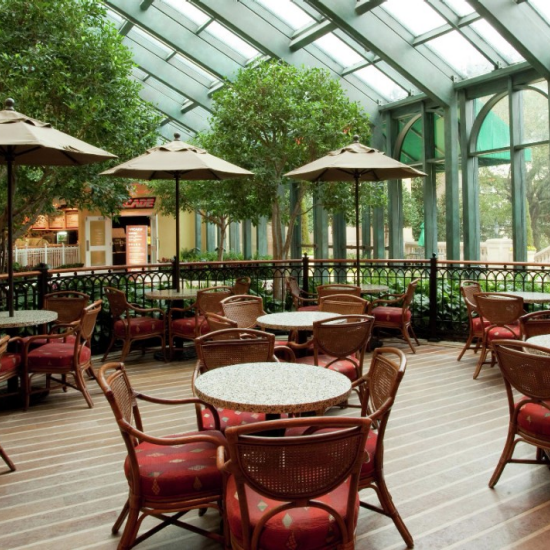 From the Hotel Lobby, continue past the Hotel Front Desk on the right to The Promenade. Walk through The Promenade Shops toward West Valet. The Roasted Bean will be on the right next to the north patio entrance. Exit from the parking garage elevators and take a right through the glass doors onto The Shopping Promenade. The Roasted Bean will be on the left. Fast, fresh and just a few steps from your favorite casino games. Incredibly rich and creamy ice cream and other super-premium frozen desserts.